Dealing with problem behaviors starts at home. 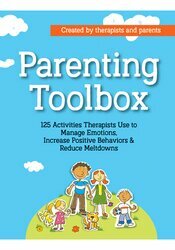 The Parenting Toolbox is filled with easy-to-use strategies, backed by science, to overcome challenges and strengthen parent-child interactions - one worksheet, activity and exercise at a time. Cognitive Behavioral Therapy (CBT) focuses on changing negative thoughts, beliefs and attitudes. Brief, targeted exercises can teach ways to recognize and replace unhealthy thoughts, improving emotions and behaviors. Dr. Lisa Weed Phifer, DEd, NCSP, is a Nationally Certified School Psychologist who has extensive experience providing school based mental health services to children and adolescents. Her work has focused on facilitating student engagement, trauma informed education practices and advocating for the mental health needs of the students. Jennifer Hunt Roden, Med, CAGS, has over 20 years of experience as a school psychologist. Roden is also a freelance vocalist, yoga practitioner, and passionate outdoor enthusiast. Laura Sibbald, MA, CCC-SLP, is a nationally certified speech-language pathologist and mentor therapist. She values multi-disciplinary approaches and collaboration to work toward student growth and achievement. She is an accomplished presenter and has had the opportunity to provide training and highlight novel initiatives through presentations at the state and national level.